There's an unusual harvest at Falbury Farm: beans, hay…show tunes. 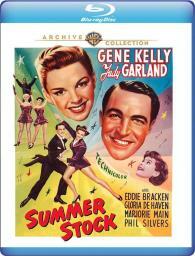 It's a bumper crop, too, with Judy Garland and Gene Kelly leading all the hoofing, singing and sparking. In her final MGM musical, Garland plays Jane Falbury, a farm owner more than a bit riled when her aspiring-actress sister (Gloria De Haven) shows up with a theatrical troupe that wants to stage a musical in the family's barn. Any guess who becomes the show's sudden star after its lead runs off with a Broadway actor? Highlights include Kelly's shuffle-and-squeak "You, Wonderful You" dance solo making use of loose boards and newspaper on the floor, tuxedo-topped Garland's leggy, joyous "Get Happy" and a Kelly/Phil Silvers country-bumpkin bit of "Heavenly Music" backed by woofing canines. After a show like this, how're you gonna keep these kids down on the farm?